Benicia sits near the mouth of the Sacramento River, in the northeastern corner of San Francisco Bay. It has a small-town vibe: antique stores, a pretty marina, nice views of the water. But it’s no stranger to heavy industry. Freight trains rumble past on the outskirts, and there’s a big industrial park. 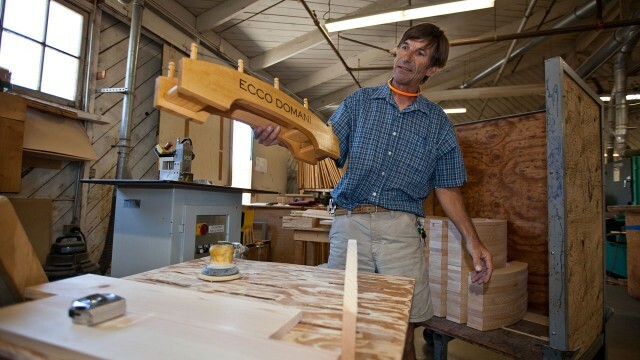 Ruszel Woodworks has been in the industrial park for more than 30 years. Brothers Ed and Jack Ruszel manage the company, which builds custom retail displays, among other specialty items. Their shop is just down the road from the refinery. They say Valero's been a generally good neighbor, but they're not happy with its latest proposed project. Valero wants to build a rail terminal on its property -- currently it gets crude oil from pipelines and tanker ships. The $70 million rail project would allow it to source crude from the Midwest and Canada. The plan includes equipment to unload up to 70,000 barrels of crude oil a day. That’s almost half the daily capacity of the refinery. Two 50-car trains a day would deliver the oil, which would replace some of the crude that currently arrives by ship. Many Benicia residents support the project. Valero is a big employer. It gives to local charities, and its taxes represent a fifth of the city’s general fund. But the Ruszels are concerned about the impacts on traffic, because the tracks are on either side of their building, and cross their driveway. "And it doesn’t just affect me," adds Jack. "It affects all the businesses up and down here, and all the people along the rail lines all the way back to the source." Another local business got a cease-and-desist order stalling upgrades to the nearby Union Pacific tracks, which would support the project. Caltrans has weighed in too, with fears that the long, slow-moving trains crossing near off-ramps could back traffic up onto Interstate-680. 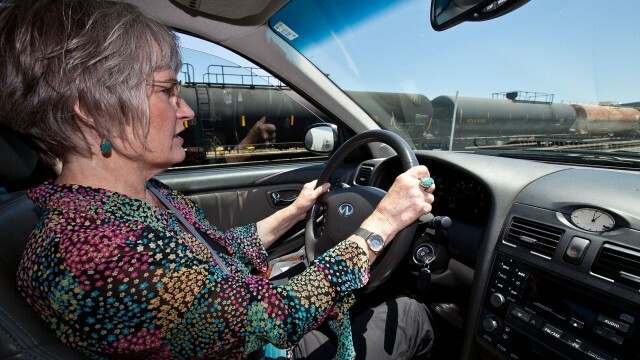 "For California, rail is the equivalent of the Keystone pipeline." But traffic is just one of the issues locals have raised. "Where does it begin, where does it end?" Marilyn Bardet is the founder of the Good Neighbor Steering Committee, a Valero watchdog as she describes it. She sits on Valero’s community advisory panel. She’s among those who have been pushing for a more thorough review of the project. "If you have an accident where you spill this stuff, how are you going to clean it up?" she asks. "Where does it begin, where does it end?" The tracks go through Suisun Marsh, the largest brackish marsh on the West Coast, and a delicate wildlife habitat. There are safety concerns. Last month in Quebec, a train carrying crude oil derailed and exploded, killing 47 people. The Federal Railroad Administration has set rules to help prevent that type of accident from happening here, but Bardet says it’s been on her mind. And there’s perhaps the biggest question of all: what kind of crude will be coming in? Will Crude From the Tar Sands Come to the Bay Area? "All crudes are not created equal," claims Brant Olson, a campaigner with the Natural Resources Defense Council in San Francisco. He says Valero has hinted to its investors that it wants to start bringing in crude from Canada’s tar sands, also known as oil sands. That oil is heavy, and environmentalists say, exceedingly “dirty” – it contains heavy metals, and the chemicals used to dilute it for shipment can be toxic, too. "If you’re taking in dirty oil from Canada on the front end, you’re going to have more pollution in Benicia out the back end, and that’s really our concern." "For California, rail is the equivalent of the Keystone pipeline," Olson says. "There’s no such thing as dirty oil or clean oil." Oil companies, on the other hand, are eager to find a way to get that low-cost crude to refineries in the United States, including here on the West Coast. "Whether it’s in Texas, up in Canada, in the Northeast, in the Marcellus Shale, up in the Dakotas in the Bakken Shale, that’s where the new crude oil is coming from, and there are huge amounts of it," says Bill Day, a spokesman for the San Antonio-based Valero. "There’s no such thing as dirty oil or clean oil, I want to be very clear about that." Day won’t get more specific than to say that the crude would be coming by rail from “North America.” He says that no oil from the tar sands is currently being processed at the Benicia refinery. The plant is however, designed to be able to process "a variety of crudes," from heavy to light. The Bay Area Air Quality Management District is reviewing Valero’s permit application for the project. Jim Karas, director of engineering for the Air District, says Valero is already close to the limit of what it can put in the air. "On a conceptual basis, I don’t see how those emissions can possibly increase," he says. "Our rules don’t allow it. Our conditions don’t allow it. Our monitoring will verify it. So I don’t see how that could happen." And if it did happen? "We would absolutely catch it, and there would be significant consequences." The Air District has installed monitors in and around the refinery, Karas says, and inspectors go out and do tests. But Bardet is worried that the coverage is spotty. "They do not have other monitors in town," she says. "They have a monitor at Tuolumne Street in Vallejo and one in Concord, and that’s supposed to give us some sense, triangulated, what our ambient air is like." "This is not just a California thing and it’s not just a Valero thing." She also claims that the Air District measures pollution over time, focusing on averages and missing the impacts of emissions spikes or accidents. 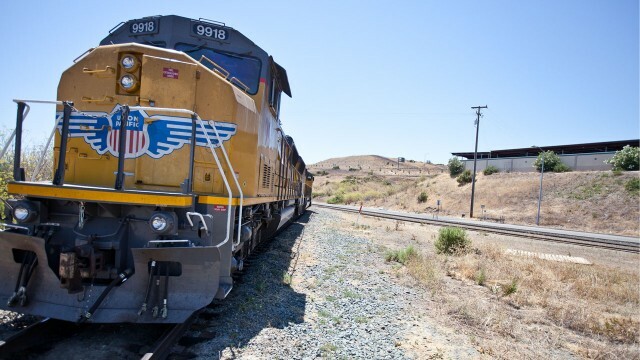 This would be the first major crude-by-rail project in the Bay Area. 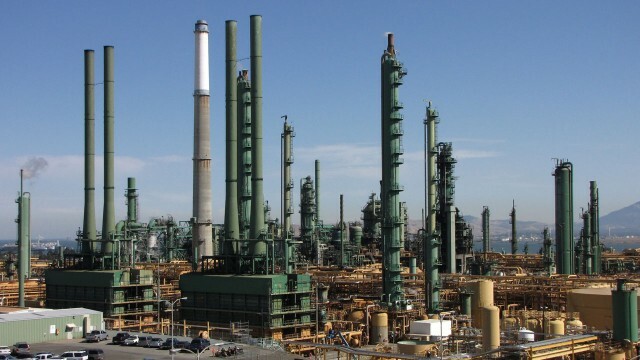 Of the other four refineries here, Tesoro Corporation is the only one using rail to import crude, and on a scale far below what Valero would be capable of, should its rail expansion go through. Valero's Day says, he wouldn’t be surprised if others are looking into it. "This is not just a California thing and it's not just a Valero thing," he says. "This is a phenomenon that we’re seeing across the country." The City of Benicia is studying the impacts of the project. Its planning commission is expected to make a decision on it in December or January.